One of the south of Scotland's most popular wedding venues has closed, as the owners apply for bankruptcy. Comlongon Castle in Dumfries and Galloway ceased trading last week after "encountering liquidity problems" over the last year. The move came as a shock to couples with weddings booked at the venue, with one telling BBC Scotland of fears they could be left £6,000 out-of-pocket. A small number of staff have also been made redundant. Accountants Johnston Carmichael said it was set to be appointed as trustee to the partnership that owned, operated and managed Comlongon Castle. People who have bookings with the hotel at Clarencefield have been asked to contact the accountancy firm. Its restructuring partner Donald McNaught said: "We will be dealing with creditors' claims after the partnership business behind Comlongon Castle encountered liquidity problems during the past year and ceased trading just over a week ago. "We are aware that the time between Christmas and Easter is widely recognised within the hotel industry as a difficult trading period - and the business arrived at a point where it could no longer continue to operate. "I would encourage anyone who had a booking with the hotel to get in contact with Johnston Carmichael immediately." Childhood sweethearts Suzanne Campbell and William Wakefield have spent two years planning their dream wedding. The 23-year-olds who met at school were counting down the last 12 weeks to their big day at Colmongon Castle on 6 July. Their decision to select the restored 15th Century castle was an easy one, Ms Campbell, a nursery practitioner, told the BBC Scotland website. "We had a few venues in mind and when we went to Comlongon, we fell in love with the grounds," she said. "We thought it would be nice for pictures, everybody seemed really friendly, it seemed like the perfect place really." With a deposit paid, they ordered flowers, decorations, a cake, a DJ and a photographer. Mr Wakefield, a chef, had spent time meticulously going through the menu and their 70 guests had replied with their food choices. At the end of the March, the couple from Dumfries paid a visit to the hotel to add to their deposit - bringing it to a total of £6,000. "Everything seemed fine, and everyone there was happy enough," she said. But on Friday Mr Wakefield's father heard a rumour from a friend at work that the hotel was closed. When Ms Campbell sent an email to find out more details, she received an automatic reply confirming its closure and adding details of the administrator. "We were devastated really, and angry that no one had contacted us from Comlongon," she said. Now they are frantically searching for a new venue for their wedding - and hoping to get their £6,000 back. Ms Campbell said: "I'd like an apology from Comlongon, our wedding to go ahead, and to get our money back." Couples who planned to marry at Colmongon Castle were promised a memorable wedding in the "romantic medieval great hall". It was popular with couples keen for a traditional wedding in a Scottish castle - particularly with people from outside Scotland. Set in 140 acres of gardens and woodlands, the castle is attached to a 14-room hotel. On its website, the owners claim to have had more than three decades of experience at successfully organising weddings. It was also marketed as a country house hotel "specialising in quiet getaways". Owner Phillip Ptolomey said his parents bought the hotel in 1984, after it was up for sale for many years. It was suffering from neglect, but he said the building has since been extensively renovated. After taking it over in 1995, he said he continued to upgrade the castle and the hotel - but it came at a cost. 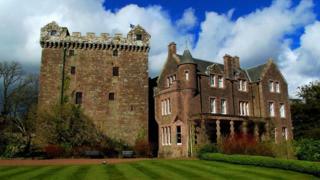 Writing on the hotel website, he said: "Every penny generated goes to the restoration of the castle and estate. "This work will probably never be finished as constant upgrades require a budget far in excess of that generated by being run as a hotel. "However, this castle deserves to be saved, restored and to survive."